Gudrun talks to Carlos Mauricio Rojas La Rotta. They use a Skype connection since Carlos is in Berlin and Gudrun in Karlsruhe. Carlos is an electrical engineer from Colombia. His first degree is from Pontifcia Universidad Javeriana in Bogotá. For five years now he has been working at Schneider Electric in Berlin. In September 2018 Gudrun met Carlos at the EUREF-Campus in Berlin for discussing the work of Claire Harvey on her Master's thesis. The schedule on that day was very full but Gudrun and Carlos decided to have a Podcast conversation later. Carlos came to Germany as a car enthusiast. Then he got excited about the possibilities of photovoltaic energy production. For that from 2005-2007 he studied in the Carl von Ossietzky Universität in Oldenburg in the PPRE Master course Renewable Energies. When he graduated within a group of about 20 master students they found a world ready for their knowledge. Carlos worked in various topics and in different parts of Germany in the field of renewable energies. Now, at Schneider he has the unique situation, that he can combine all his interests. He develops the most modern cars, which are driving with renewable energy. In the course of his work he is also back at his original love: working with electronics, protocols and data. The work on the EUREF-Campus in Berlin started about 8-10 years ago with more questions than clear ideas. Schneider Electric is a big company with about 150.000 employees all over the world. They deal in all types of software and hardware devices for energy delivery. But the topic for Berlin was completely new: It was a test case how to construct energy sustainable districts. They started out investing in e-mobility with renewable energy and making their own offices a smart building. It is a source of a lot of data telling the story how energy is produced and consumed. At the moment they collect 1GB data per day in the office building on about 12.000 measure points into database and build this as a benchmark to compare it to other scenarios. The next step now is also to find ways to optimize these processes with limited computational possibilities. This is done with open source code on their own interface and at the moment it can optimize in the micro smart grid on the Campus. For example with 40 charging points for e-cars - consumption is planned according to production of energy. On Campus traditional batteries are used to buffer the energy, and also a bus now works on the Campus which can be discharged and is loaded without a cable! One can say: Carlos is working in a big experiment. This does not only cover a lot of new technical solutions. The Energiewende is more than putting photovoltaic and wind power out. We as a society have to change and plan differently - especially concerning mobility. Schneider Electric just started an expansion phase to the whole campus, which has a size of 5.5 ha and 2500 people working there. More than 100 charging point for e-cars will be available very soon. 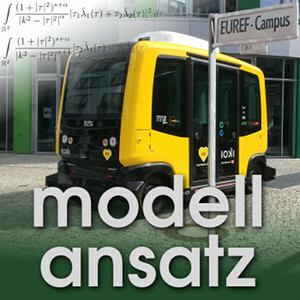 C. Harvey, G. Thäter: Micro Grids, Gespräch im Modellansatz Podcast, Folge 186, Fakultät für Mathematik, Karlsruher Institut für Technologie (KIT), 2018.